سرگلزائی, شکوه, حسین زاده سلجوقی, فرانک, آقایاری, هادی. (1397). ارائه روشی نوین برای رتبه بندی اعداد فازی با استفاده از مرکز محیطی دایره و کاربرد آن در ارزیابی عملکرد مدیریت زنجیره تأمین. تصمیم گیری و تحقیق در عملیات, 3(3), 236-248. شکوه سرگلزائی; فرانک حسین زاده سلجوقی; هادی آقایاری. "ارائه روشی نوین برای رتبه بندی اعداد فازی با استفاده از مرکز محیطی دایره و کاربرد آن در ارزیابی عملکرد مدیریت زنجیره تأمین". تصمیم گیری و تحقیق در عملیات, 3, 3, 1397, 236-248. سرگلزائی, شکوه, حسین زاده سلجوقی, فرانک, آقایاری, هادی. (1397). 'ارائه روشی نوین برای رتبه بندی اعداد فازی با استفاده از مرکز محیطی دایره و کاربرد آن در ارزیابی عملکرد مدیریت زنجیره تأمین', تصمیم گیری و تحقیق در عملیات, 3(3), pp. 236-248. سرگلزائی, شکوه, حسین زاده سلجوقی, فرانک, آقایاری, هادی. ارائه روشی نوین برای رتبه بندی اعداد فازی با استفاده از مرکز محیطی دایره و کاربرد آن در ارزیابی عملکرد مدیریت زنجیره تأمین. تصمیم گیری و تحقیق در عملیات, 1397; 3(3): 236-248. 1دانشکده ریاضی، دانشگاه سیستان و بلوچستان، زاهدان، ایران. 2دانشکده علوم، دانشگاه شاهد، تهران، ایران. ارزیابی عملکرد از دو دیدگاه روش ارزیابی و قطعیت محیط ارزیابی، مورد ‌بررسی قرار می­گیرد. یکی از روش‌های مناسب برای ارزیابی عملکرد، تحلیل پوششی داده­ها است. در این مقاله، ابتدا به تعیین کارایی فازی با استفاده از تحلیل پوششی داده­ها پرداخته و سپس روش جدیدی برای رتبه­بندی کارایی­ها ارائه شده است. با توجه به اهمیت رتبه‌بندی اعداد فازی، روش‌های زیادی ارائه شده است ولی روشی که نتایج رضایت‌بخشی برای همه شرایط داشته باشد، وجود ندارد. تعدادی از روش‌های رتبه‌بندی از نقطه تعادل عدد فازی، به عنوان نقطه مرجع استفاده می­کنند مانند مرکزوار ذوزنقه (نقطه تعادل ذوزنقه)؛ اما مرکز محیطی دایره مرکزوار، تعادل بیشتری نسبت به سایر نقاط دارد. در این پژوهش، روش جدیدی با استفاده از مفهوم ترکیب آفین روی مرکز محیطی دایره برای رتبه‌بندی اعداد فازی ذوزنقه‌ای و مثلثی ارائه‌ شده ­است. روش پیشنهادی را می‌توان برای بسیاری از فازی‌زدایی‌ها به‌کار برد. این روش، بسیار ساده است و به محاسبات پیچیده نیازی ندارد. عملکرد صحیح روش و مزایای آن با چند مثال عددی و هم‌چنین بررسی یک مطالعه موردی در خصوص مدیریت زنجیره تأمین نشان داده شده است. 1Department of Mathematics, University of Sistan and Baluchestan, Zahedan, Iran. 2Department of Science, Shahed University, Tehran, Iran. Since much of human reasoning is based on imprecise, vague and subjective values, most of decision-making processing, in reality, requires handling and evaluation of fuzzy numbers. Ranking fuzzy numbers is one of very important research topics in fuzzy set theory because it is a base of decision-making in applications. Although so far, many methods for ranking of fuzzy numbers have been discussed broadly, most of them contained some shortcomings, such as requirement of complicated calculations, inconstancy with human intuition and indiscrimination. In this paper, we introduce a new method by using of the affine combination on the circumcenter. This method ranks various types of fuzzy numbers which include normal, generalized trapezoidal, and triangular fuzzy numbers along with crisp numbers with the particularity that crisp numbers are to be considered particular cases of fuzzy numbers. The advantages of the new proposed are that it can be applied for most of the defuzzification and the calculation is far simple and easy than previous methods. The effectiveness of the proposed method and its advantages is demonstrated by numerical examples, comprehensive comparing different ranking method with this method and also its benefits will be illustrated by the numerical example, as well as a case study on supply chain management. Abbasbandy, S., & Asady, B. (2002). Note on A new approach for defuzzification. Fuzzy sets and systems, 128(1), 131-132. Abbasbandy, S., & Asady, B. (2006). Ranking of fuzzy numbers by sign distance. Information sciences, 176(16), 2405-2416. Abbasbandy, S., & Hajjari, T. (2009). A new approach for ranking of trapezoidal fuzzy numbers. Computers & mathematics with applications, 57(3), 413-419. 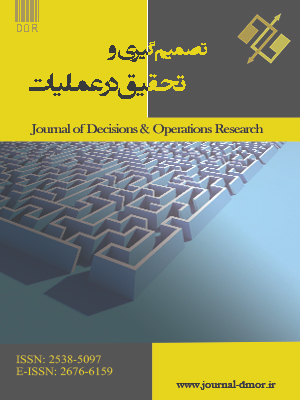 Azadi, M., Jafarian, M., Saen, R. F., & Mirhedayatian, S. M. (2015). A new fuzzy DEA model for evaluation of efficiency and effectiveness of suppliers in sustainable supply chain management context. Computers & operations research, 54, 274-285. Bowlin, W. F. (1998). Measuring performance: An introduction to data envelopment analysis (DEA). The journal of cost analysis, 15(2), 3-27. De Campos Ibáñez, L. M., & Muñoz, A. G. (1989). A subjective approach for ranking fuzzy numbers. Fuzzy sets and systems, 29(2), 145-153. Sarrico, C. S. (2001). Data envelopment analysis: A comprehensive text with models, applications, references and DEA-solver software. Journal of the operational research society, 52(12), 1408-1409. Cheng, C. H. (1998). A new approach for ranking fuzzy numbers by distance method. Fuzzy sets and systems, 95(3), 307-317. Chen, L. H., & Lu, H. W. (2001). An approximate approach for ranking fuzzy numbers based on left and right dominance. Computers & mathematics with applications, 41(12), 1589-1602. Chen, S. H. (1985). Ranking fuzzy numbers with maximizing set and minimizing set. Fuzzy sets and systems, 17(2), 113-129. Chu, T. C., & Tsao, C. T. (2002). Ranking fuzzy numbers with an area between the centroid point and original point. Computers & mathematics with applications, 43(1-2), 111-117. Hatami-Marbini, A., Ebrahimnejad, A., & Lozano, S. (2017). Fuzzy efficiency measures in data envelopment analysis using lexicographic multiobjective approach. Computers & industrial engineering, 105, 362-376. Rao, P., & Shankar, N. R. (2011). Ranking fuzzy numbers with a distance method using circumcenter of centroids and an index of modality. Advances in fuzzy systems, 2011, 3. Saati, S. M., Memariani, A., & Jahanshahloo, G. R. (2002). Efficiency analysis and ranking of DMUs with fuzzy data. Fuzzy optimization and decision making, 1(3), 255-267. Wang, Y. M., Luo, Y., & Liang, L. (2009a). Fuzzy data envelopment analysis based upon fuzzy arithmetic with an application to performance assessment of manufacturing enterprises. Expert systems with applications, 36(3), 5205-5211. Wang, Z. X., Liu, Y. J., Fan, Z. P., & Feng, B. (2009b). Ranking L–R fuzzy number based on deviation degree. Information sciences, 179(13), 2070-2077. Yager, R. R. (1981). A procedure for ordering fuzzy subsets of the unit interval. Information sciences, 24(2), 143-161.